The Kingdom of Morocco since ancient times was famous for craftsmanship and creativity of leather tanning. The town of Fez, surrounded by endless pastures, was inhabited by skilled artisans who purchased inexpensive raw material of good quality from nomadic tribes. Apparently, Moroccan tanners learned from ancient Egyptians who practiced suede finishing of hides since ancient times. Vessels made of suede, found during excavations of Egyptian settlements, have an affinity with the early products from Morocco, but over time the disciples surpassed their teachers. 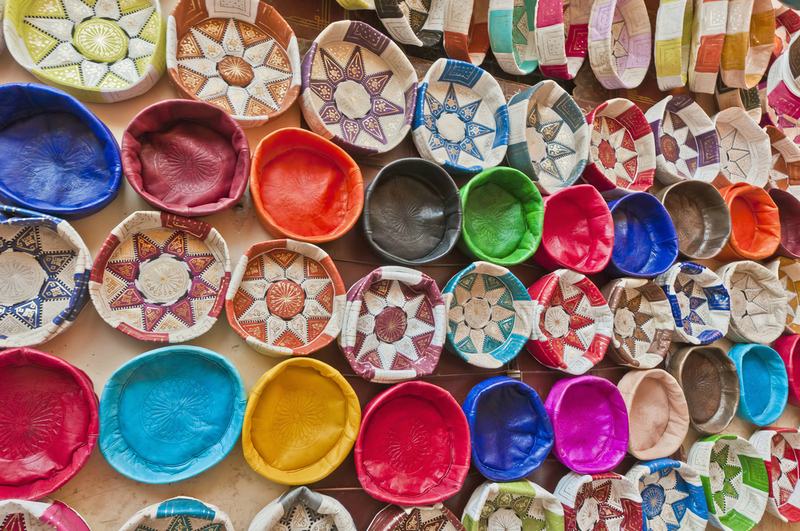 By the beginning of the 11th century Moroccans possessed effective methods of tanning and dyeing raw hides, which formed the basis for the production of amazing smooth and soft Morocco leather. The Old Testament technologies have survived till now virtually unchanged: local craftsmen stubbornly follow antiquated methods. All manipulations are made by hand, and the only available means of mechanization are hoses for water supply from river flowing nearby. Although tourists are sure to get lost in motley ant hill of the medina of Fez el-Bali, heavy spirit of dampness and decay accurately leads any inquisitive traveller to the Chouara Tannery. So it goes, that the mixtures used to soften hard animal skins include malodorous natural ingredients such as donkey urine and pigeon droppings. Agile apprentices helpfully tray mint leaves for impressionable tourists, although a gas-helmet would be more appropriate. Tanneries are located in courtyards and in the streets nearby there is a brisk trade in ready-made leather goods. In the bazaars there is a dizzying array of shops selling every item you could imagine from saddle bags to covers for the latest iPhone. Flat roof terraces of neighbouring houses give a breath-taking view of the rows of mud baths, preserved since Marinids dynasty. Honeycomb of pits, filled with coloured liquids, is reminiscent of palette with watercolours; freshly painted leathers drying on terraces, look like mischievous blots showing through on the stone fabric. The workshops, to be honest, are dirty, but each leather item is surrounded by care and attention. Miraculous transformation of slimy animal skin lump into exclusive collection of handbags or Moroccan poufs much favoured by designers, is preceded by a series of puzzling procedures worthy of high-end spa. However, at the entrance there is a strict face control: trespass is strictly prohibited for pork skin! Processing welcomes only leather of sheep, goat, cow and camel - clean animals, the meat of which is eatable by the Koran. Preparation of leathers for dyeing begins with a long soaking in quicklime, destroying hair follicles and protective animal fat layer. To soften calloused animal skins, they use a hell of a mixture based on a concentrated salt solution with the addition of organic nitrogen. At this stage, very important is a keen eye of an experience master: the slightest overexposure may damage the work piece. To assess readiness, leathers are sometimes removed from the bath and washed thoroughly with fresh water at the reels acidified with lime juice. Tanners then scrap away excess hair fibres and fat in order to prepare the skins for dyeing. In total fat and salt leaching from the deep layers of the dermis, takes about a month. After a short drying raw hides are placed into a tanning bathes, managing to change at least a dozen of vats while moving from weak translucent solutions to strong concentrated potion abruptly smelling of tar. Selection of active agents depends on the destination of the material. Especially valuable items selected for tailoring clothes and traditional Moroccan slippers, known as chuviaks with curled toes, are treated with a chromium compound, after which leathers becomes supple, stretchy and soft to the touch. When tanning haberdashery raw hides, they use extracts of oak bark, chestnut and fir with a high tannin content, which increases the capacity of skin elasticity. As a result, bags perfectly keep their shape and elegant patterned ottomans puffs sold unstuffed, meekly tolerate transportation being folded. Each colour is derived from natural sources like plants and trees: red dye is obtained from paprika, green comes from mint, brown from mimosa bark, and the combination of saffron and pomegranate peel gives different shades of yellow. Mixing dyes in different proportions, craftsmen receive complex multi-faceted tones that rival brightness of industrial dyes. On the market square, the mill operates all day long, it grinds dried vegetable ingredients for toners. Dyeing of sheep skin and goat skin takes about a week; cow skin needs twice as long, and camel skin gets dyeing for a month. From time to time tanners jump into a dye-filled pit and trample raw hides achieving an equal distribution of the pigment over the entire thickness of the leather item. At the same time, they work on finishing of Marocco leather: oil infiltration and rubbing wax prepare leathers for a fight with the elements, protecting the southern juicy dyes from fading. Thoroughly rinsed and freshly processed leather dries quickly leaving cutters without a moment's peace. Although bargain in craft shop is the sacred right of a tourist, it is useful to recall the working conditions of dyers, who gave a start in life for a pretty purse with ethnic ornament. Swimming against the current of the river of time, is a luxury which has to be paid for, and the coin is a fairly modest fee compared to squandered health and chronic poverty.